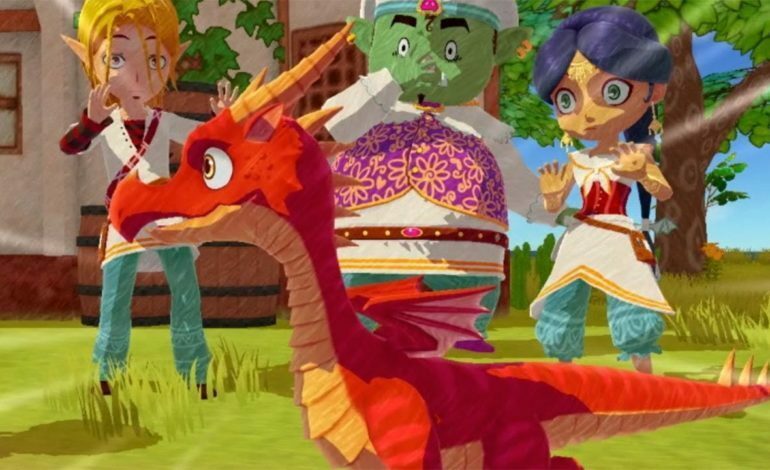 mxdwn Games had the chance to interview the game designer of Little Dragon’s Cafe, Yasuhiro Wada, who is also known as the creator of Harvest Moon series and Stardew Valley. The Harvest Moon series has always been very popular around the world. Players who like the series will also be very likely interested in Little Dragon’s Cafe. The work tells that a pair of twin mothers suddenly fell asleep. At this time, a mysterious old wizard tells the twin that only by raising a dragon can they wake their mother, and the two must take up the operation: the heavy responsibility of the family cafe, train the baby dragon, solve the troubles of the coffee shop guests, and waiting for the mother to open her eyes. mxdwn: The mother of the protagonist twins will be unconscious because there is half the dragon’s blood in her blood, so the twins are 1/4 mixed dragon born, so will they face this situation in the game? What is the connection between saving a mother and growing a dragon? Mr. Wada: First of all, to answer the first question. Please rest assured that during the game, there will be no situation in which twin is also in a coma. The reason why the mother is lethargic is that the blood of the dragon flowing through the body is relatively thick. After all, it is 1/2 mixed blood, and the twins are 1/4 mixed. At present, there is no danger of coma, but there is still a crisis. To answer the second question of why the baby dragon is the key to cure. The game story will gradually develop along with the development of the dragon. During this time, various characters will appear, and players will get rich information from them. These contents are closely related to the rescue of the mother. In the process, the player can know the reason why the blood flowing through the dragon will be unconscious and find a solution. In this way, if a similar situation occurs in the twin in the future, you will know how to respond, and there is no need to worry. Mr. Wada: No limit! Please take the game slowly and don’t worry, it doesn’t matter if you spend a decade playing, even though Gemini will grow up in that time (laughs). The gameplay usually will take 36 to 50 hours. mxdwn: Are there four season in the game? Mr. Wada: Although there is a day-night alteration, we don’t have the seasonal design in the game. In fact, in the game planning stage, it was indeed considered to add seasonal changes, but because this is a brand new original work, we want to focus on the most crucial part of the game. Moreover, if you want to make four seasons of spring, summer, autumn, and winter, you need to spend four times the current funds and time, but we hope to show the charm of this game to the world. If the player’s response is good, we will consider adding seasonal changes in the next game. mxdwn: There are a lot of guests visiting the cafe every day. Players need to help them solve all kinds of troubles. What compensation can they get after they are solved? Mr. Wada: The main axis of this work is still to promote and experience the plot. When the player is helping to solve the troubles of the guests, the purpose is not to make money, but feeling the joy of helping others. Regarding game content, this story is to help a guest to release the next plot. The baby dragon will grow with the story, and the exploration field will expand, and players will be able to venture to more places. This means that this is also a kind of reward. mxdwn: Can players have a close relationship with NPCs like some of the works in the Harvest Moon series? Mr. Wada: Just “thanks for letting me meet this person” mood. Players may be mad about the first time they meet some characters, but after understanding their story more deeply, I believe that everyone will gradually like these people. While helping and communicating with all kinds of people, you also save my mother. mxdwn: Depending on the weather, the number of guests visiting the cafe will be different. Will the monsters that appear during the adventure change? Mr. Wada: Although there are no special changes, the details are slightly different. For example, some monsters do not appear on rainy days, and some monsters take hunting at different times, and the harvested materials will be different. In the early days of development, the changes we have decided are still very large. For example, some monsters only appear at night, and some materials can only be picked in the morning. But in the end, I realized that if you follow this form, the player needs to pay attention to the time during the game. “I have to go out at night!”, which will give people a limited, forced homework pressure. So we adjust to the current form. Basically no matter when the player chooses to go out and take risks, the results are the same, very considerate to take care of the players. mxdwn: In addition to the already announced pheasant and wild boar, are there other kinds of monsters? Mr. Wada: There are only two kinds that can be used directly as ingredients. In addition to this, there is a monster shaped like a marshmallow, floating in the air. When the player is flying in the dragon, the dragon is set with endurance. If the endurance value is too low, it will not be able to continue flying. At this time, if it is in contact with those marshmallows, it can restore the endurance of flying with the dragon. mxdwn: In addition to helping the hunt during the adventure, how can Dragon help the protagonist in running the cafe? Mr. Wada: Dragon will not directly assist in the operation of the store, but the ingredients needed to make new dishes will not be available without the dragon. mxdwn: The protagonist can fly on the dragon, what is the operation in flight? Mr. Wada: Dragon will continue to flap to maintain the height. The corresponding button is exemplified by Playstation 4. It is the O button on the handle. After reaching a certain height, use the left stick to slide forward. mxdwn: When the coffee shop is in very good condition, can you open other types of shops? Mr. Wada: Nope, but I think it will be almost when I come to “Little Dragon Cafe 7”. The sequel can be renamed “Little Dragon Town” (laugh). mxdwn: The ingredients found in the adventure can be harvested from the coffee fields and fishing nets in the future. Do you need to farm and fish like the Harvest Moon? Mr. Wada: The ingredients can be directly harvested in the plowing field without cultivating. If the player wants to squat on the hoe, it will become Harvest Moon, but the fishing part still exists, and you can let your dragon dives into the ocean and get fish for you. mxdwn: Is the dragon attacking the prey automatically, or is the player giving instructions to instruct it to attack? Mr. Wada: The player indicates it. After the game starts, there will be instruction. You will know the specific operation, just press a button. After pressing, the dragon will take various actions, jumping, hitting prey or diving fishing. mxdwn: We see the game is about family, but why is there no father figure in the game? Mr. Wada: (deep breath) No one has ever asked me that before. It’s a good question, and you will see the reason once you get there in the game. mxdwn: Finally, I would like to thank Mr. Wada for your humorous and patient answers. I hope that the game can really reach to Little Dragon Cafe 7 in the future. Little Dragon’s Cafe will be available on Playstation 4 and Nintendo Switch on Aug 24, 2018.